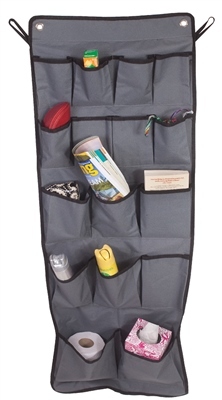 Keep your tent organised with the Classic Tent & Awning tidy. Conveniently store items out of the way yet still easy reach. The perfect storage solution for your family tent, keeping it nice and tidy. The Classic Tent & Awning Tidy is a useful set of 16 various sized pockets that attach to the inside of your tent, providing great storage and easy access to all of your camping essentials. This vertical tent and awning tidy can be attached to your tent or awning in a variety of ways using the two hanging loops, two eyelets and two 'S' hooks provided.